Origins of Cinco De Mayo? Mexicans love mayonnaise. They ordered a huge shipment and a ship sailed from Europe with a full shipment of Mayonnaise. As it was crossing the Bermuda Triangle, it mysteriously began sinking. The captain wired the shipping company in Europe, "we have run into a serious problem in the Bermuda Triangle, and ship is sinking". 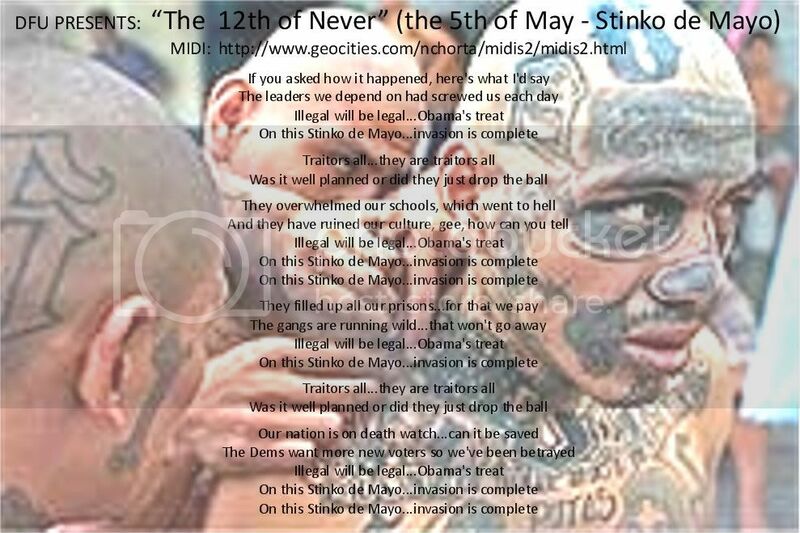 The captain was not good in Spanish, so he wired port authorities in Mexico, "Sinko De Mayo". Later on it was changed to Cinco de Mayo! May 5 and June 30 have been selected as the days for 1 day "strikes", where American Citizens will transact no commerce: Remain home from work, using vacation, leave, sick time or whatever is available to you. Take no public transportation. Transact no business. Make no purchases. Consider turning off your TV, radio and computers. For one day, make no contribution to the economy of the nation. For one day focus on the home, family, books etc.